Sinkholes occurring above karst formations in limestone are not uncommon. The swath across China where such limestone formations exist has horrific sinkholes, for instance, as do some parts of Florida. Since Planet X arrived in 2003, the area north of the St. Lawrence Seaway has experienced them. Texas has karst and consequently has sinkholes. And one of the worst swallowed an entire city block in Guatemala. The Zetas have long warned that the stress on the plates, in particular the North America bow, will increase the incidence of such sinkholes. The US is laced with karst limestone, and the bow is tightening. ZetaTalk Explanation 7/14/2007: We have mentioned that N America is being bowed and pulled on a diagonal, and at some point large quakes along the New Madrid will occur. Mexico is being pulled to the West, while New England is being pulled to the East. In addition, the West Coast is being pulled into a bow near the Southern California area, which will create cracks in the Arizona area. The recent sinkhole in Mexico is only more evidence of this. 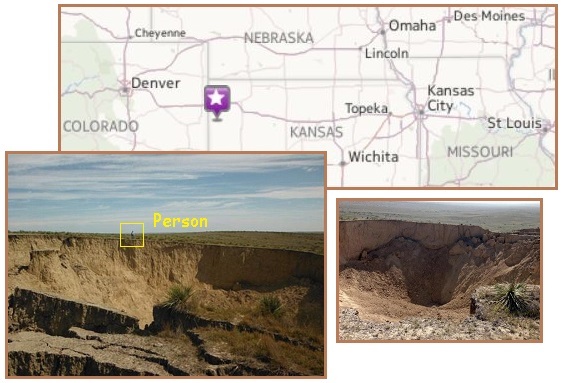 Kansas is not known for their sinkholes, but as noted in this Pole Shift ning blog, a big one opened up recently in Sharon Springs, in western Kansas. Karst territory indeed. Sheriff Larry Townsend said the void is surrounded by cracks, suggesting that it is getting bigger, and at this time, there is no telling when it will stop expanding. ‘Man had nothing to do with this. This is a God thing,’ the sheriff stated. ‘ There's no oil well around here, there are no irrigation wells anywhere near. This is something that just happened.’ It remains unknown what caused the ground to open up in the first place, or how to prevent the sinkhole from swallowing more land. Meanwhile, the sinkhole as Assumption Parish in Louisiana continues to grow, and has even developed waves generated from some activity deep within. Experts are stumped, but the one factor they are not considering is the stress from the North American bow. Last covered in Issue 347 of this newsletter on May 26, 2013. Assumption Parish Police Jury blog reported abundant surface water movement and burp event in the center of the sinkhole starting early on July 19, 2013. Video released on the same day shows sudden water movement at sinkhole area with tidal wave characteristics. At Assumption Parish public briefing held on July 16, 2013 Gary Hecox, CB&I hydrogeologist stressed that they have talked to some of the leading experts in the world as too what could be causing the problem. Here is his short statement from the briefing: "Nobody’s ever encountered anything like this in the history of mankind. I’m not kidding, what’s going on with that cavern where it’s going up several hundred feet and down several hundred feet, we don’t know if it’s some equipment issues or if there’s something going on in the cavern that we don’t understand. The pressure in the cavern continues to slowly increase. It’s up now to almost 600psi in the wellhead, that’s brine pressure not gas. I don’t even have a good hypothesis to tell you. The world experts have looked at this and we don’t know. Oil eating bacteria, which deplete the oxygen in the water, have created the largest ever “dead zone” around this sinkhole, showing how much oil is leaking from that cavern and perhaps others nearby that have been breached. This likewise was noted when the BP gulf oil spill occurred in 2010, but not to this extent. 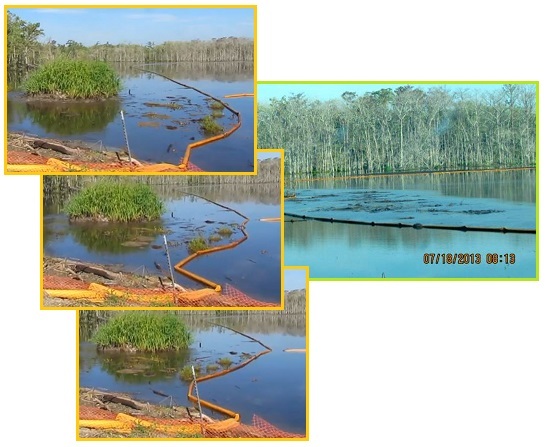 Thus the Louisiana sinkhole, as an oil leak, is worsethan the BP oil spill! 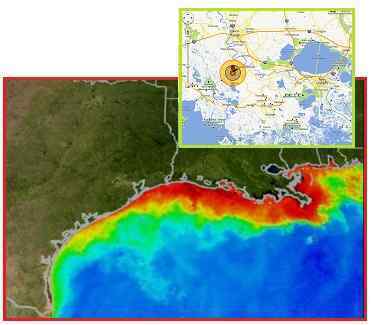 Scientists discovered the new microbe while studying the underwater dispersion of millions of gallons of oil spilled into the Gulf following the explosion of BP's Deepwater Horizon drilling rig. Their findings are based on more than 200 samples collected from 17 deepwater sites between May 25 and June 2. They found that the dominant microbe in the oil plume is a new species, closely related to members of Oceanospirillales. The bacteria may have adapted over time due to periodic leaks and natural seeps of oil in the Gulf. Scientists also had been concerned that oil-eating activity by microbes would consume large amounts of oxygen in the water, creating a "dead zone" dangerous to other life. But the new study found that oxygen saturation outside the oil plume was 67-percent while within the plume it was 59-percent. According to an annual estimate from National Oceanic and Atmospheric Administration (NOAA) sponsored modelers at the University of Michigan, Louisiana State University and Louisiana Universities Marine Consortium, this year’s dead zone could be as large as 8,561 sq. miles—roughly the size of New Jersey. That would make it the biggest dead zone on record. And even the low end of the estimate would place this year among the top 10 biggest dead zones on record. Barring an unlikely change in the weather, much of the Gulf of Mexico could become an aquatic desert. Per the Zetas, these dead zones are caused by oil eating bacteria, which reduce the oxygen in the water when they flourish and feed. And this is likely just the start! ZetaTalk Comment 8/10/2013: How coincidental that the largest dead zone ever in the Gulf is clustered around the coast where the Louisiana sinkhole has been burping and burbling oil! What might be happening nearby, in that fractured oil filled salt dome, to cause this? Despite the excuses provided by the frantic establishment, the dead zone is not caused by fertilizer runoff. It is caused by oil eating bacteria which reduce the available oxygen in the water when they are feeding. This will only get worse, even if the US oil reserves are pumped out and stored elsewhere. The Gulf was leaky before the BP spill, and this will all exacerbate during the bowing of the N American continent and the rupturing of the New Madrid Fault line. During the S America roll, the continent of S America is likewise put into a bow. The top part pulls to the West, while the lower portion is blocked along the Andes by bumping into the Nazca Plate. 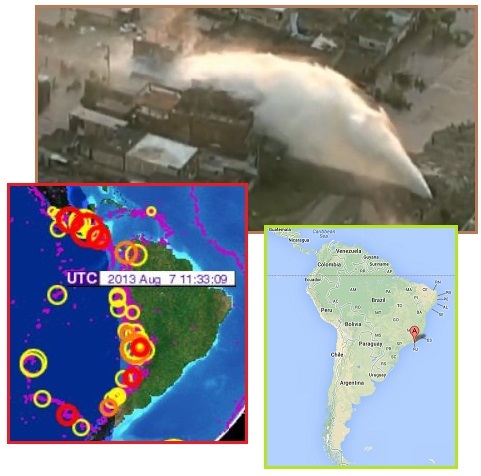 During a recent violent water main rupture in Rio, as depicted in this Pole Shift ning blog, this was once again shown to be the case. Quakes along the southern Andes, and stretch zone accidents to the East. ZetaTalk Explanation 1/15/2011: S America is tugging to the west, along its top side. But as much as there is stress along the northern Andes where the S American Plate slides over the Nazca Plate, there is more stress along the southern Andes. Why would this be? The rolls that S America and Africa will do is primarily at the Equator, where the spreading apart of the Atlantic and the compressing of the Pacific is at an accelerated pace. The tip of S America does not roll, but remains nailed in place. For the top portion of S America to roll to the west, something must thus give, and to some extent this is the southeastern portion of S America. There is already a seaway developing at Buenos Aires. The burst water main released a torrent of water over a residential area in Campo Grande just after 5:00am on July 30. Cars were tossed like toys by the powerful torrent of water which swept away numerous homes. The cause of the rupture was not immediately clear. Power to the neighborhood has been cut. The Zetas were asked about a new crop circle in Ipuacu, Santa Catarina, Brasil and described it as depicting the S American bow. This was depicted in Issue 269 on November 27, 2011. Note the correlation in location! The bow stress described by the Zetas in 2011 is where this recent massive water main break in Rio occurred! Zetas right again! ZetaTalk Analysis 11/19/2011: Where the S American continent can anticipate a 90° crustal shift, the 7 of 10 scenarios, the S American roll, will alter the landscape. S America is bending, pulling apart so that the seaway at Buenos Aires will be expanded. But as the flooding along the Rio Parana shows, this area is being stretched also and will stretch along the curve south of Rio de Janeiro, the 30° swatch on the crop circle. The large circle to the right is the Buenos Aires stretch, and further south along Argentina, the next circle to the right. Will there likewise be a stretch in the Amazon? This too is indicated by the circles to the left, but not as significant as the coastal area.